Tube CAD Journal: Book Review: "Audio Reality"
Mr. Rozenblit does not hedge his answers or hide his low regard for the sillier fringe of the hobby. This will no doubt please those who side with him and, somewhat surprisingly, those who wish to dismiss his book without having to bother to read it. "He doesn't use tantalum resistors; he must be either insensitive to musical nuance or an idiot," I can hear them saying as they look down the parts list. I am sure that their criticisms do not inflict much torment on Mr. Rozenblit, as he has a very healthy outlook on the endeavor called high-end audio, which he refers to as "….a wonderful hobby, pastime, and intellectual pursuit." He let us know very quickly that he does not see it as a salvation, a mystical greed, a path to nirvana, or a social status footstool. In fact, Spilling the Tube Audio Beans might have been a better title to Mr. Rozenblit's book. I find the book's title seems poorly matched to its table of contents. The book is divided into two parts: "Audio Science" and "Projects." he covers how do the components work and physics behind the components in the first half of the book and five projects of his own design in the second half. 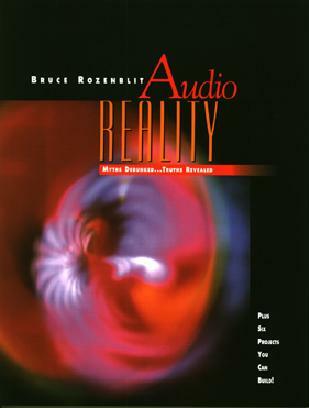 Throughout the book, but particularly in the introduction and the last words of the book, he gives us his views concerning these doings, his philosophy of audio design; hence, the title Audio Reality. Still, I find the title ill-fitted to a book that recommends common sense and frugality as needed virtues in a hobby as weird, farcical, and irrational as Audio can be at times. While voicing my complaint concerning the book's title and it its contents to my wife, Anna, she replied that An Insider's Guide to Tube Audio Design would be a better choice. I agree. Clink, clink, clink, CLUNK, clink, the coins in my hand sounded on the their way to my pocket. Where did the CLUNK come from? I opened my hand and saw, there amidst the zinc, a silver quarter. I was reminded that event after having read a few pages of Bruce Rozenblit's new book, Audio Reality: Myths Debunked...Truths Revealed. Like the solid clunk of silver ringing true, here in Mr. Rozenblit's book, I was reading solid tube-audio related text. Amidst my monthly staple of audio magazines and books appeared a book that meant something beyond advertisement and ego. Mr. Rozenblit is an electrical engineer, B.S.E.E. and he owns Transcendent Sound, the maker of tube OTL amplifiers and tube preamps; in addition, he knows the ins and outs of amplifying signals through vacuum tube equipment. Fortunately for us, he has decided to spill the beans in this book.